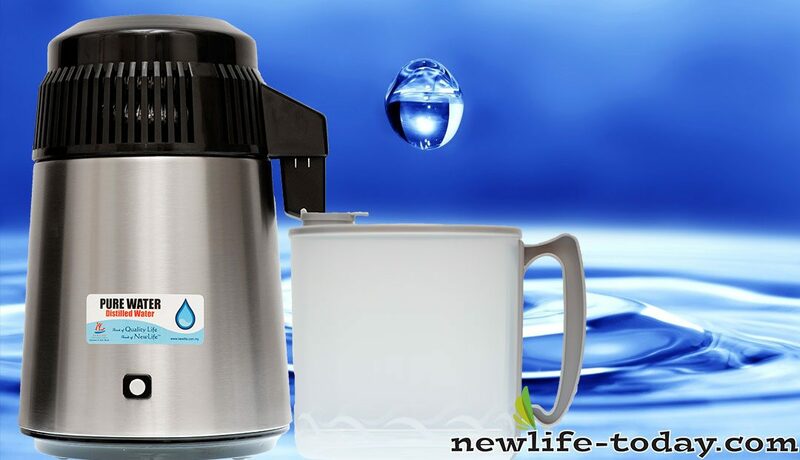 Buy this Pure Water Distiller (with PP bottle) at RM 1367.90 (20% off retail) when you become a member of NewLife International. DISTILLATION is the MOST FUNDAMENTAL process of water purification. It has provided water for thousands of years throughout the world by the natural cycle of evaporation and condensation.This cycle is known as the hydrological cycle which is nature’s way of purifying our water.The sun turns surface water into vapour, it rises, leaving impurities behind, then it cools in the atmosphere returning to earth in a purified form such as rain. Unfortunately, due to the atmospheric pollution and contaminants, rain water has now become unfit for drinking. 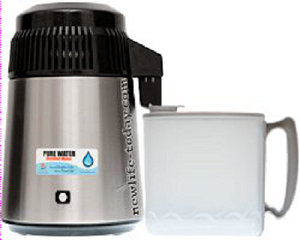 NewLife has recently brought in an improved COUNTERTOP WATER DISTILLER. 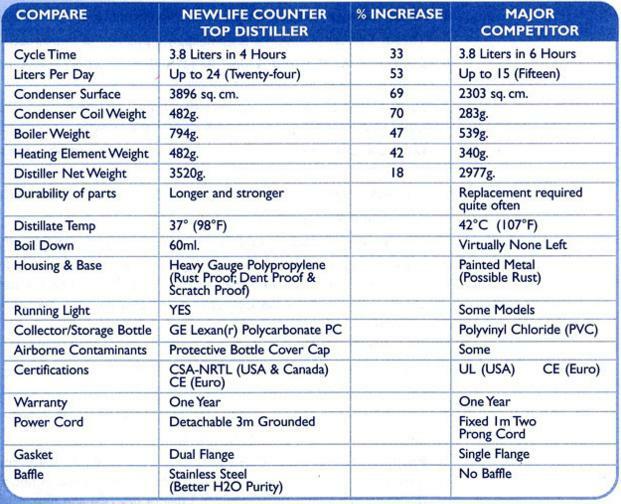 It is a US Patented product and is produced specially for Newlife International only. Does Distilled Water Leach Minerals from the Human Body? Without a healthy organic mineral balance inside and outside the cells of muscle, blood, and bone substructures, the body will begin to spasm, twitch and cramp, eventually deteriorating to a full “rigor complex”, and/or complete failure. Minerals can be likened to the key to your car: it is a small component, but nevertheless an essential one.And a few inorganic minerals are needed (like sodium), but the food is still the best source. It is no wonder that the body prefers the richest source of minerals, from organic foods, instead of the hard-to-absorb minerals in tap water. Even if human tissue suddenly developed the ability to absorb inorganic minerals from tap water, it would take an enormous amount of tap water to supply the bare minimal mineral quantities for proper life functions. If (for example) the ample inorganic mineral content of the tap water in Reno, Nevada were modified so that it would convert the daily Calcium requirement (RDA) from its inorganic calcium solutes, one would have to drink 7.4 gallons of their tap water. 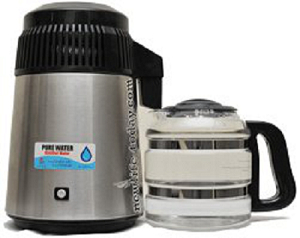 Pure Water Distiller is portable, simple to use and lasts very long with minimal maintainance. 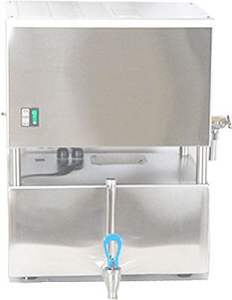 This portable distiller holds 1 gallon of water ( approx 3.3 liters ). This unit comes with PP bottle. Durable under hot water and get not as fragile as glass bottle. Automatically turns off when distillation is complete. Ever wondered which distiller to buy?